Hi @Andrei, for Android users without access to the Google Play store could you offer a link to download the APK directly from the website? I remember reading a while back that you talked about having the phone app being able act as the server, so when working with multiple computers they could both sync with it. Since the latest version of android there is no synchronism with the desktop version 1.2.6!!! I have donwload de latest version (1.2.8) but it doesn’t solve the issue. I create a task in the inbox in android app but i dont see this task in the desktop app. If you revert to the previous version you had, does it start working? Originally that was planned, but as far as I’m aware today, a server app can’t be made to work reliably an Android. Unless you manually start it every time you want to sync… But at this point it would be easier to leave the phone as a client and have double configuration for different networks. I dont know how to revert to the previous versión in Android, I have revert to the versión 1.2.6 app but this doesn’t solve the issue. I have proved to uninstall the android app and reinstall again but this doesn’t solve the issue. 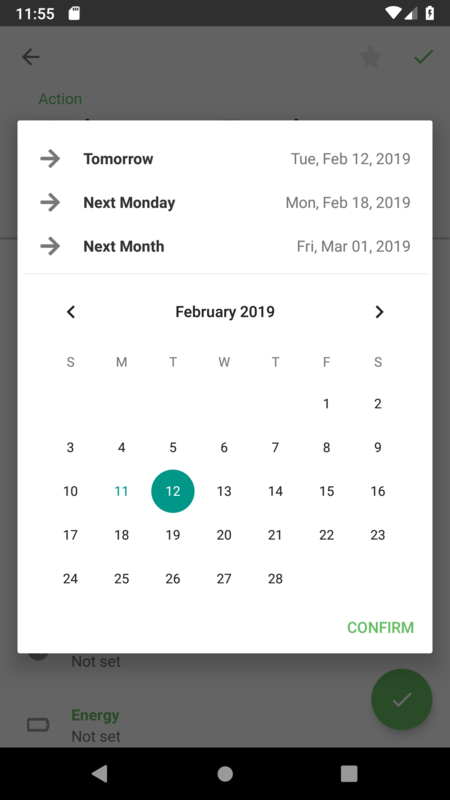 At the Android app y can change due dates but I don’t find a way to eliminate due dates. Great Andrei. I’ve just updated the app and it seems to be working fine. I attach screenshots of Everdo an Nirvana Android apps for “Waiting” and “Scheduled” views. With Nirvana the space seems to be better optimized and the design more atractive. Could you please take this suggestion into account for future updates? Agreed, the layout of items needs improvement, especially in the Waiting list. I think It’s a good idea to move the waiting contact to the bottom of the title. This will also provide more space to add the waiting days counter. 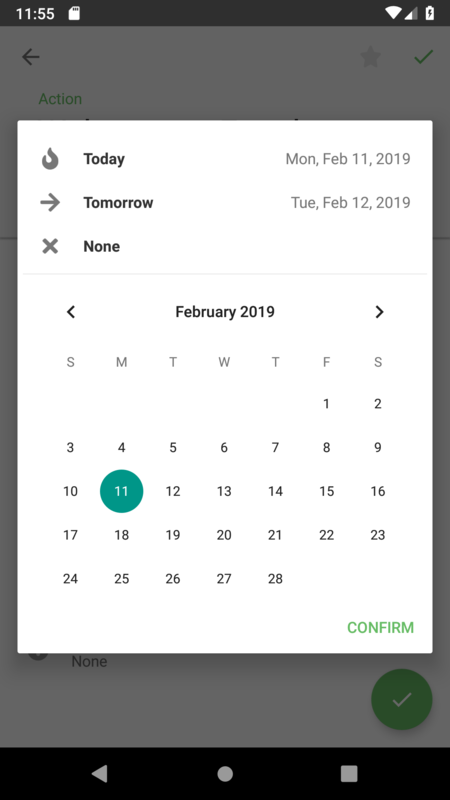 I can’t manually reorder tasks in the Waiting and Focus views in Android. Ordering in the Waiting list indeed doesn’t work, but in Focus it should work. Are you sure it’s Focus? What about Inbox/Next? @Andrei, you’re right. It works in inbox and focus. But doesn’t work in focus. Is it in the road map? It works in inbox and focus. But doesn’t work in focus. So does it work in Focus or doesn’t? In Waiting there’s a bug. It will be fixed promptly. It works in inbox and in Next. Regarding the focus folder it works with Next stsrred items but it doestn’t work with waiting starred items. Great update for the Android app ! Will it be possible to remove tags not used like on Windows app ? Congratulations and thanks for taking into account our suggestions!! !